A Haggadah sets forth the order of the Passover Seder or ritual meal that retells the story of the Israelites’ flight from Egypt based on the biblical book of Exodus. The manuscript in question demonstrates the stages and symbols of the ritual through 75 illustrations that fill the margins of almost every page. 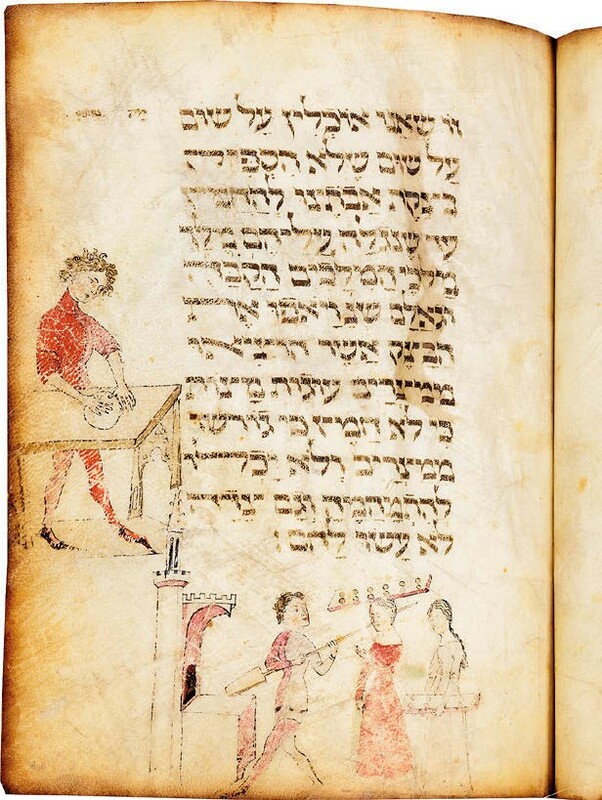 The Lombard Haggadah, made in medieval Milan c.1390-1400, was last on display at the Paris World’s Fair in 1900 when it was in the possession of a French family. 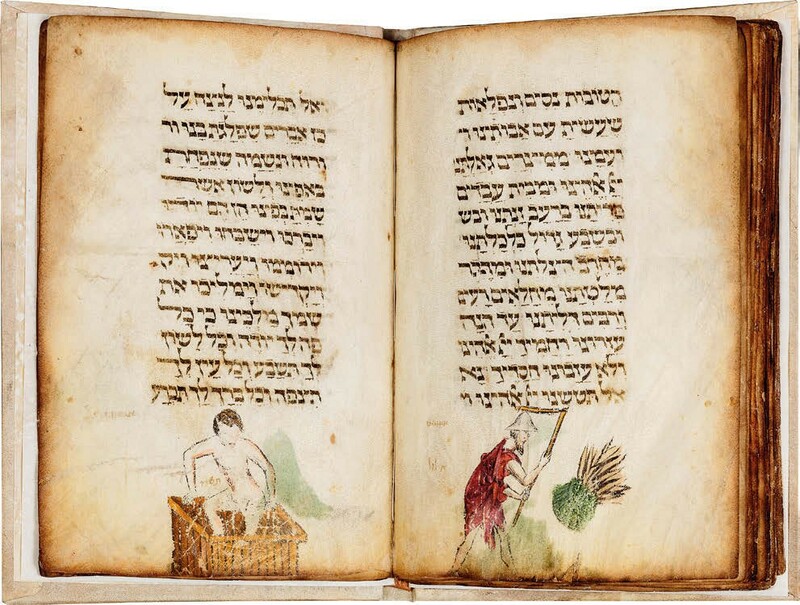 It sold in 1927 in London to Zalman Schocken, a noted collector of Hebrew manuscripts, and has remained in private hands since then. 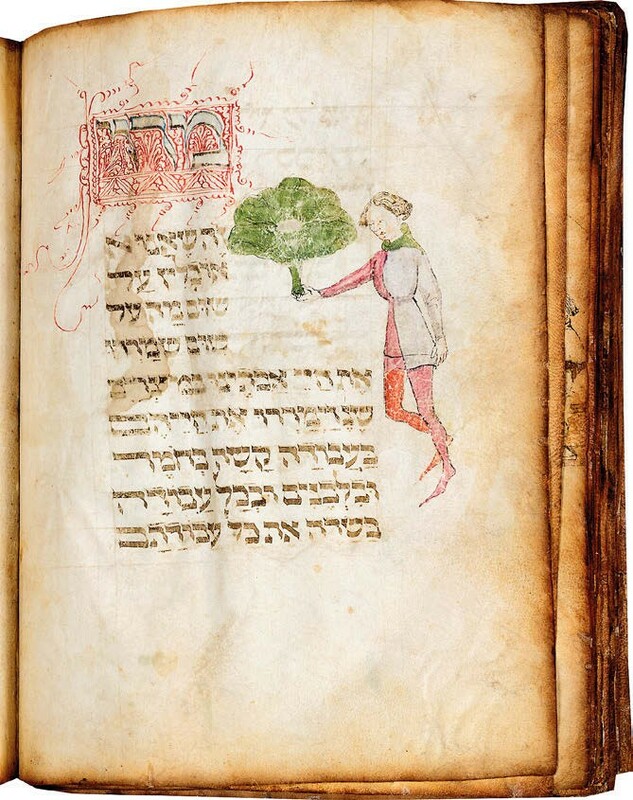 Though little known, it is one of only three illustrated medieval Haggadot (the plural of Haggadah) still in private hands and is the earliest known stand-alone Italian manuscript of its type. It is now on offer once again for a mid to upper seven-figure sum at Les Enluminures. It remains on show until April 20, just after the start of Passover on the evening of the 19th. The identity of the commissioner is unknown but the presumed date of its origin in the late 14th century corresponds to a time when a wave of northern European Jews emigrated into Lombardy. They were welcomed by Duke Gian Galeazzo Visconti, whose family patronised Giovanni de Grassi (c.1398), a master builder, sculptor and illuminator. This work is thought to have come from his workshop. Sharon Liberman Mintz, curator of Jewish art at the Jewish Theological Seminary describes the illustrations as “fresh, charming and sometimes unique” among Hebrew illuminated manuscripts. They are prime examples of Gothic International style. One key image shows a man holding the Seder plate during the ritual retelling of the story of the Israelite liberation from Egypt. The figure, delicate and elongated, reflects a fusion of northern European and Italian influences. All the figures are depicted in pale watercolour washes over pen and ink outlines, characteristic of Giovanni’s workshop. One remarkable image shows a servant dressed in fashionable attire but bearing the ‘bitter herbs’ of enslavement (bitter herbs are a core part of the Seder meal). 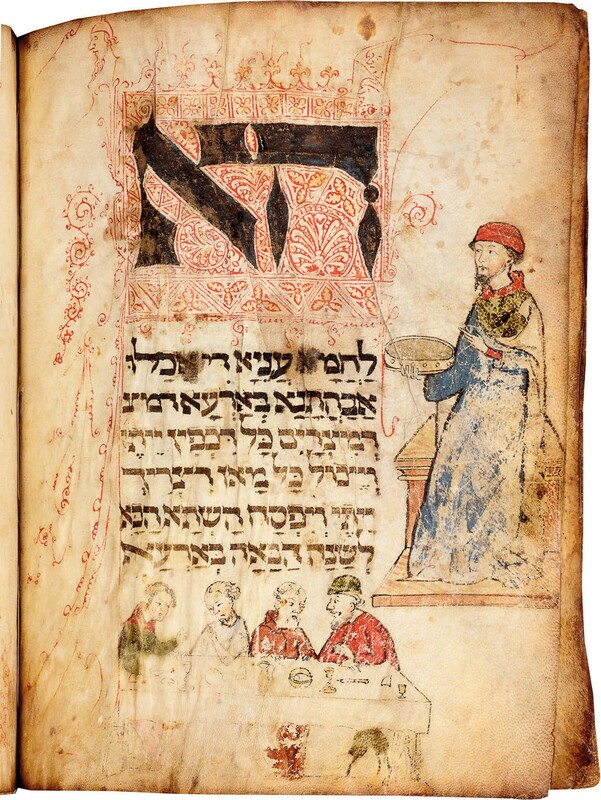 The inclusion of the servant is an ironic commentary on the free status of the wealthy Jewish patron who commissioned the manuscript. Most unusual, however, is a series at the end of the manuscript illustrating the Labours of the Month (activities characteristic of each part of the year). These relate the work to Books of Hours made in the same period for Christians. Les Enluminures organised several events to accompany the exhibition of this Haggadah, including a gallery talk and a conference on the subject of Haggadot in the Middle Ages.